ERROR DOCTOR 2006 will fix hidden bugs and errors on your PC and increase the overall performance speed of your computer by as much as 300%. ERROR DOCTOR? is the most advanced Error Remover software on the market today! ERROR DOCTOR? will Scan your Registry and give you a detailed list of errors broken down by type Absolutely FREE. 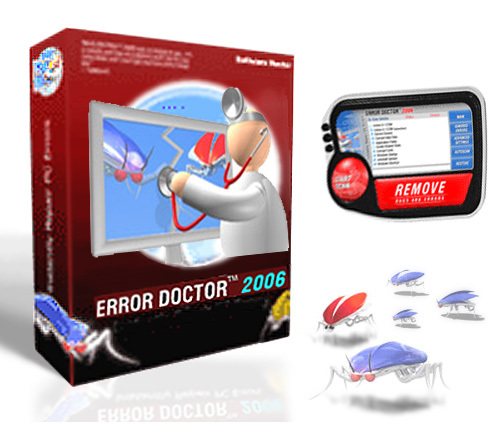 ERROR DOCTOR 2006 Error Remover Software, FREE - Fix Errors, Remove Bugs and Increase the Speed of your PC. ...... Statistics show that 93.7% of personal computers have corrupt and potentially dangerous files with 150 or more errors on them. Let the award winning ERROR DOCTOR? software repair those errors for you today so you can enjoy a faster and more efficient PC. By default, ERROR DOCTOR? scans the registry for all types of errors. This is the simplest way to clean up the registry. Automatic Scan is recommended for 'non-technical' users. After the scan is complete, ERROR DOCTOR? will show you a full list of errors with details, and let you fix individual invalid entries or all invalid entries of a certain type. Before scanning your registry for errors, ERROR DOCTOR? gives you the option to create a backup file(s) that can be used to undo the changes. Qweas is providing links to The PC Error Doctor Fix 2007 as a courtesy, and makes no representations regarding The PC Error Doctor Fix or any other applications or any information related thereto. Any questions, complaints or claims regarding this application The PC Error Doctor Fix 2007 must be directed to the appropriate software vendor. You may click the publisher link of The PC Error Doctor Fix on the top of this page to get more details about the vendor.